Families can be tough work, as every child and parent knows – especially during school terms, with all the inevitable early morning tension. 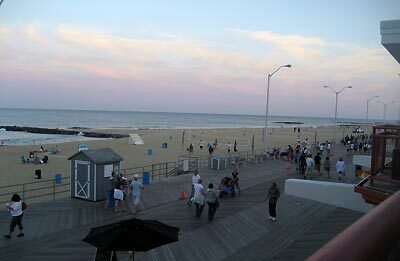 That’s why you have to get away sometimes, even if it’s only a distance of three hours and 150 miles – where a half-mile of rejuvenated Asbury Park boardwalk and beach offers something almost frighteningly Baleiric. We hit the Berkeley-Carteret hotel for four nights last week, and had a total blast. No expensive flights, no jet lag, no crying kids and temper tantrums; plenty good food, drink, music, play time, warm water – and even warmer memories. 1) Watching the hilarious animated penguin fake-doc movie Surf’s Up on the beach with Campbell, Thursday evening, courtesy of surf store Lightly Salted. As we nestled in under store owner Jen’s kindly loaned blankets, both of us with ices from the nearby boardwalk, we realized that this was something of a Burning Man moment. Minus the art cars perhaps, and the roving cocktail bars, too, but Playa Time nonetheless – and given that we’re giving Black Rock City a miss this year, probably as close as we’ll get to it. 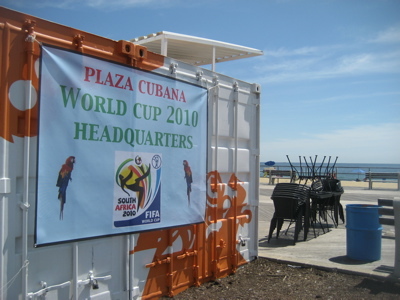 2) Watching the World Cup at various boardwalk bars and cafes. What with living in the countryside these days and the games occurring so early in the day, the most daring I’d experienced the World Cup until now was drinking tea with fellow English dads in Woodstock. In Asbury Park I made up for that. I watched the second half of the Spain-Portugal game sitting outside La Plaza Cubana stand in the mid-afternoon heat, listening to Spanish commentary for once; watched Holland-Brazil at Pop’s Garage over a long, lazy vegan breakfast, somehow avoiding the temptation of the $3 draft Dos Equis being poured right in front of me, and joined at various points by the double restaurant’s multi-national staff – who were given their lunch break during the last ten, tantalizing minutes, adding to the exictement; and rounded out the trip over Presidente beers with fellow avid footie fans (all of them American in this case) at the bar of the Langosta Lounge for the Ghana-Uruguay match, where eventually, it now being Friday afternoon of the July 4 weekend, the sound was turned up and the entire packed restaurant stopped to watch Ghana cruelly miss that 121st minute penalty. Seemed a shame to have to turn off the TV and return to the beach. Probably just as well that there was no World Cup at all for two of our four days! For reasons I can’t explain, this place did NOT open early for the Brazil-Holland game. 3) Feeling the ocean get warmer beneath our feet. We timed our beach visits for low tide, which grow 40 minutes later each day; come Friday afternoon, we didn’t get into the water until almost 6pm, by which point the Atlantic felt positively warm, like getting on for bath temperature. The only thing better than watching Noel jump waves without his usual life jacket for company and Campbell standing protectively over him was the sight of a school of dolphins swimming along the shore line. For real. 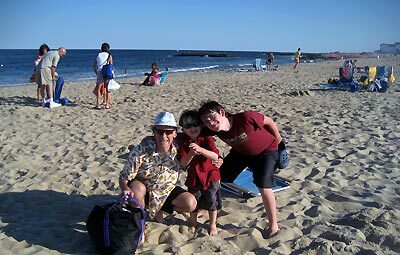 Excuse the family photo, but this was one happy trio after an early Friday evening swim. 4) Playing pinball at the Silver Ball Museum. I raved about this place last year, after it had just opened up in a Cookman Avenue basement in “downtown” Asbury Park. Wisely, it has subsequently relocated to the boardwalk, where its historic collection of some 200 pinball machines dating back to the game’s very invention, and its “pay-by-the-hour” (or better yet, by the day) policy is a guaranteed draw for every nerdy dad and, if they’re lucky, their teenage children as well. I credit myself with restraint for spending less than two hours in the place all week; the hour spent with Campbell, trying to perfect both the modern-super-techno Simpson’s game and the 1967 Beatles table, was pure quality father-son time. 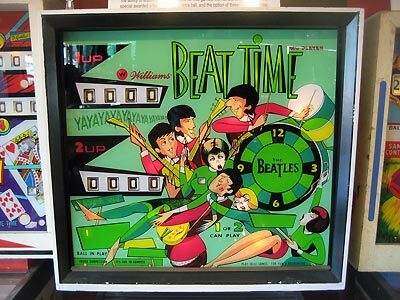 The back of the Beatles pinball table. The Silver Ball Museum also has the Tommy Wizard, the Elton John Captain Fantastic that references the same Tommy Wizard, and of course the Kiss pinball tables too. 5) It’s a toss-up between… running every morning on the boardwalk, loving just how easy it was on the legs compared to the hills of the Catskills, and how the early morning sun and run quickly shrugged off any effects of an extra drink the evening before; watching the drum circle and hula hoop dancers on the boardwalk Tuesday evening; trying to lure the stray kittens out from their hiding place beneath the Boardwalk, lamenting the tough life they have ahead of them; hanging out with Posie at the Beach Bar watching reggae duo DNA even later that night; watching the Wednesday night fireworks as a family from a balcony dining table at Tim McLoone’s; returning to the beach after the family went to bed that night and listening to Quadrophenia on my iPod from the waterline while watching the moon come up over the ocean; having a late night Tequila cocktail with the wife at the spiffy Watermark bar Thursday night; lounging by the Berkeley-Carteret pool watching Noel and Campbell become amphibious; collecting Posie’s mother from her assisted living nearby and taking her out for a surprise meal; playing mini-golf with the family, watching Noel go from complete novice to fair golfer in the space of just a few holes; taking Noel out on his bike each morning for a mile to get coffee (the hotel didn’t have any! ); putting the kids in the Spash! Water park for a couple of hours for a couple of days; seeing those two kids dote on each other all week long and remembering the true meaning of family; and on the drive home, late Friday evening – late enough to avoid the July 4th weekend traffic, which was smart – having Campbell issue an unrequested “Thanks for the great vacation.” You’re welcome. 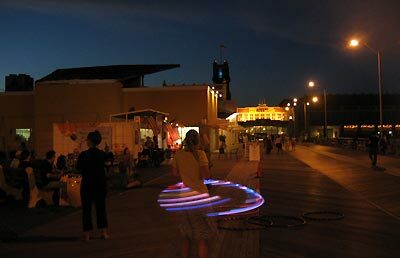 Hula hoop dancers at the drum circle on the Boardwalk, Tuesday night. Believe me, you wouldn’t think you were in New Jersey. Hello, do you sell the Beatles pinball ?